The 5th Gebirgsj�ger Division was formed in 1940 with the 100th Gebirgs-Regiment (detached from the 1st Gebirgsj�ger Division) and with the 85th Gebirgs-Regiment (originally 85th Infanterie-Regiment of the 10th Infanterie Division). 10th ID and the 1st GD supplied also the artillery components, which became the divisional artillery Regiment, as well as the other divisional components (Recce, Panzerj�gers, pioneers, and support units). The Division was stationed in Saltzburg (Austria), although mostly composed of catholic Bavarians. and of four fighting companies (recce, artillery, engineers, and anti-tank). The force of the 100th Regiment was about 4.500 men, of which about 3.000 were fighting troops. At the end of August 1944, the Regiment was deployed in Romagna, on the Galla Placidia anti landing line, in the sector between Rimini and Cesena. On Sept.1 the Regiment was ordered to move to the river Conca valley. On Sept.3, 1944, after the Canadians had disrupted the German defenses on Green Line 1, 100th Regiment was put under the orders of 71st Infanterie-Division (General Raapke) and ordered to garrison the salient of Gemmano. 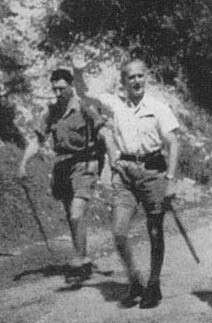 From Sept. 4 to Sept. 14, when the last two German soldiers (Ernst himself and Rohleder), following the order of withdrawing to Montescudo, left the Gemmano battlefront, the 100th Regiment fiercely challenged the British Empire forces for every single stone and for every single blade of grass. The key points of the battlefront (Gemmano, Borgo, San Francesco height, Monte Gardo (Pt. 449), and Zollara) were conquered, lost and conquered gain at least ten times by each of the combatants. "In the hard defensive fighting on the Adriatic, in the sector of Gemmano, the 100th Mountain Regiment, under the orders of Lt.Col. 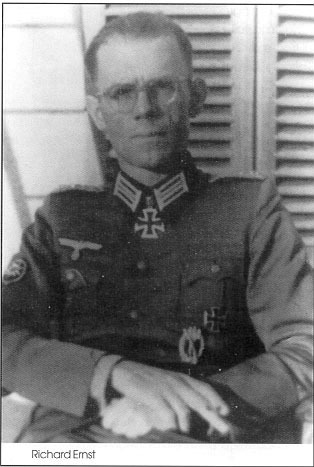 Ernst, together with an Artillery Group at his orders, with its indestructible firmness and gallant counter-attacks has behaved particularly well". 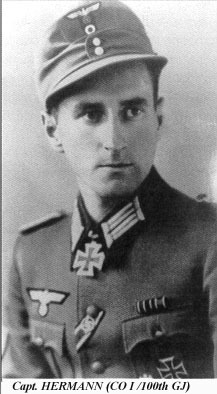 (*) the action for which Ensign Rappel was awarded the Ritterkreutz, as described by Enrst : "Rappel defended his blockhouse, then rejected the British from another blockhouse, then reconquested his own blockhouse which had fallen to the enemy. Later he gave to his own artillery the order to fire against the positions, his and of the enemies who were obliged to retire. And when a shell set fire to his blockhouse he saved his comrades from the flaming house. At last, when the flames were burnt out, he came back to the blockhouse." "How much blood this unhappy heap of ruins has drunk! Even if this waste of men had not the proportions of Cassino, the fighting here had the same obstinacy, with the same rage we fought for every house, for every ruin. 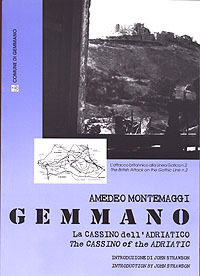 And as Cassino was the tomb of the 1st Fallschirmj�ger Division, so Gemmano was the tomb of my Regiment". 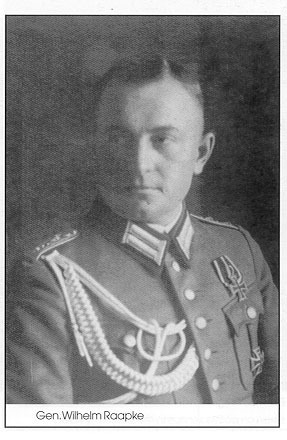 Between 1940 and 1944 the division was under the command of General Julius Ringel . 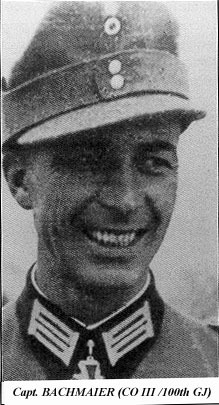 During the course of 1944 command passed to Generalmajor Max-Gunther Schrank and later, from January to May 1945, to Generalmajor Hans Steets. 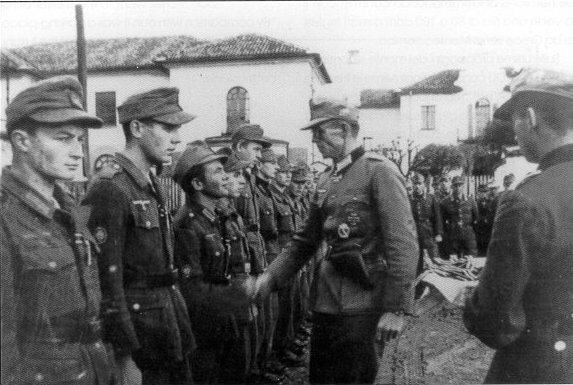 The 5th Gebirgsj�ger Division, after few months spent in training Germany (from 1940 to March 1941), took part in the invasion of Greece (breach of the Metaxas lines) and later was airlanded in Crete (Operation Merkur) where, fighting alongside with the Fallschirmj�gern, urged the British Empire forces to withdraw from the Balkans. After the success of the battle for Crete, the division was posted back to Germany for rest and refitting. 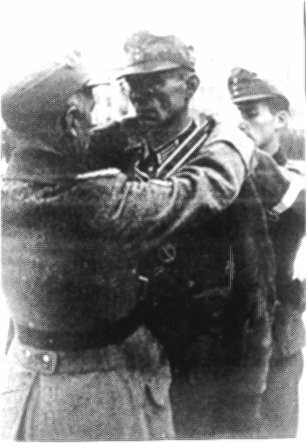 From March 1942 to December 1943, the 5th Gebirgsj�ger Division soldiered on the Eastern Front, in the Volkhov region near Leningrad. 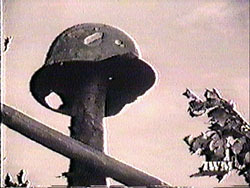 In 1944 the division was assigned to the Italian front, where it spent, under control of the 10th Arm�e, the rest of the war. During the Italian campaign the division took part in the battles fought on the Gustav and Gothic defensive lines and distinguished itself for the gallantry of its Gebirgsj�gern, who paid a severe tribute of casualties. In May 1945, after its last action near the French-Italian border, the 5th Gebirgsj�ger Division marched towards Turin. The division eventually surrendered to the Americans nearby the town of Ivrea . The images of the 5th Division shield and Edelweiss patchcut are courtesy of Peter Denniston, the webmaster of a site (Die Gebirgstruppen) fully dedicated to the German mountain troops, and in particular to the 100th Gebirgs Regiment. Well, being interested in WWII history (with a special interest for the events occurred in Gemmano), I had always said to myself : "one of these days I will make a research on these facts" ... but nothing happened until, a couple of years ago, I met with Corrado Monti, another enthusiast of the Gothic Line (he has organized a museum of artifacts, arms, uniforms and other memories from the battlefields of "Operation Olive" ) who gave me some good hints and useful material to develop my project. Amongst the other, he provided me with a book written by Amedeo Montemaggi, an historian, President of the documentation centre referred to herebelow. This book ( a bilingual Italian-British edition) contains a vast, daily chronicle of all the battles, of other military events and personal experiences of the civilians refugees, occurred in Romagna during the first three weeks of September 1944. I have "visited and widely exploited" it to create this web site. In fact, without this book this website would not have been created.